I have met so many people who have shunned quinoa because when they cooked it was hard, didn’t taste right or just looked plain wrong. 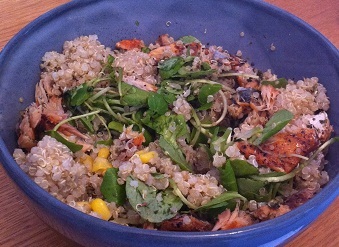 If you’re coeliac or eating a gluten free diet for whatever reason, quinoa is a very healthy alternative to gluten free pasta and rice and a good source of dietary fibre. It contains Vitamin A and E, Folate and traces of other vitamins. Per serving it is also a source of iron, calcium, magnesium, phosphorus, sodium, zinc, selenium, manganese and small amount of copper. I have very good news for you all, it’s so easy to cook if you know how. Forget the fact that it resembles couscous which cooks in minutes, it is much more like pasta or rice and needs at least 8-10 minutes to cook. Rinse the quinoa in cold water, just like you would with rice. The water will go a kind of milky colour. Drain the water you used to rinse. Mix the quinoa with with twice the amount of water. ie. 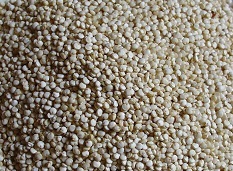 if you fill a small glass with quinoa, add two glasses of water. Bring to the boil and then simmer for 8-10 minutes. When it’s cooked the grains kind of split open and look like tiny flying saucers. Taste a little if you’re not sure, if it’s still crunchy it needs a few more minutes. Drain and enjoy with salad, stir fry, salmon etc. You could cook it in vegetable or chicken stock to add some flavour. It also keeps well in the fridge for a day or so and doesn’t clump and stick together like gluten free pasta can do. I have also used cold quinoa to make porridge the next morning. You can make porridge from scratch, with uncooked quinoa but it takes AGES compared to making normal porridge so I cheat and use already cooked quinoa with some oats. Enjoy! Do you love quinoa or loathe it? How do you cook yours?